Make meat and veggie hand pies for your St. Patrick’s Day celebration. Last week, as part one of my St. Patrick’s Day celebration, I shared recipes for corned beef and cabbage sliders and an Irish stout cheese spread. 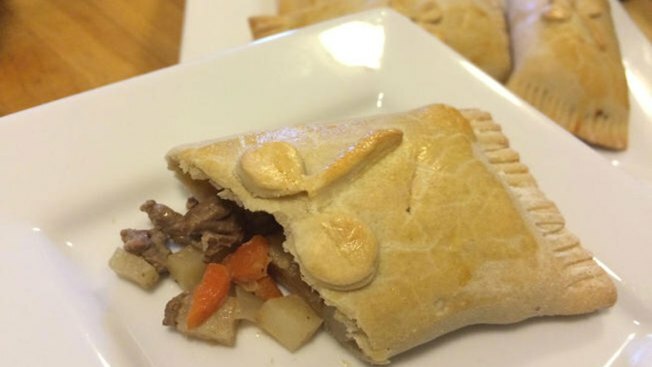 This week I’m adding Irish pasties, hearty meat and veggie filled hand pies. I am also sharing my Irish stew and banoffee pie recipes from a few years ago. Links to all past recipes are at the bottom of this page. Make the dough: Combine flour and salt in a large bowl. Cut in butter and cream cheese with a pasty cutter or two forks until mixture resemble coarse meal. Add in egg, water and vinegar and work mixture until it forms a dough. Transfer dough to a lightly floured board and knead for about 5 minutes, working in additional flour if dough is a bit sticky. Wrap dough in plastic and refrigerate for at least 1 hour. Create the filling: Heat olive oil in a large saucepan over medium low heat. Add onions and sauté for about 5 minutes until onions are tender. Increase heat to medium and add top round. Sauté until beef is browned on all sides, about 3 minutes. Season with salt, pepper and oregano, and stir. Add carrots and potatoes and continue to sauté for an additional 10 minutes. Add whiskey and stir until liquid cooks down. Add sour cream, Worcestershire sauce and Dijon. Stir until mixture ingredients are well incorporated and remove from heat. Allow mixture to cool and then divide into eight equal portions. Removed dough from refrigerator and divide it into 8 equal portions. Cover unused portions with a towel. With each portion of dough, roll it out to about a 7” square. Place 1/8 of the filling in the middle third of the dough, leaving about 1/2” uncovered on the sides. You can simply lay the top and bottom thirds over the filling or, pull the top and bottom thirds up and seal the ends together. Then flatten the sealed ends over the filling. Turn the pastie over and push the filling toward the center of the pie flattening the ends. Trim the ends to create straight edges and then use a fork to crimp them closed. Place pastie on a baking sheet. Repeat with the remaining dough and filling. Bruch pasties with egg wash. With a sharp knife, create 2-3 small slits in the top of each pie to release steam and then bake for 25-30 minutes or until golden brown. Serve warm or at room temperature.